Notre folie à nous autres est de croire aussi que toute la nature, sans exception, est destinée à nos usages. We, too, are silly enough to believe that all nature is intended for our benefit. In 'Premier Soir', Entretiens Sur La Pluralité Des Mondes (1686). French and translation in Craufurd Tait Ramage, Beautiful Thoughts from French and Italian Authors (1866), 117. But Truth is that besides which there is nothing: nothing to modify it, nothing to question it, nothing to form an exception: the all-inclusive, the complete — By Truth, I mean the Universal. The Book of the Damned (1932). In The Complete Books of Charles Fort (1975), 9. Mammals in general seem to live, at best, as long as it takes their hearts to count a billion. To this general rule, man himself is the most astonishing exception. (1965). 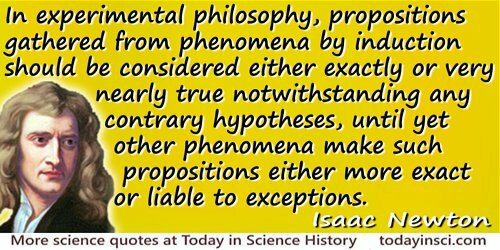 In Isaac Asimov’s Book of Science and Nature Quotations (1988), 336. In the Boston Dial (Jul 1843), 4, No. 1, 43. With the exception of lawyers, there is no profession which, considers itself above the law so widely as the medical profession. The Health Master (1913), 10.